At Tasiast, Michael Servos, Senior Drill & Blast Engineer and Korhan Tasoren, Senior Geotechnical Engineer have gone beyond conventional drilling and blasting techniques in search of new, more effective and cost efficient ways to blast. 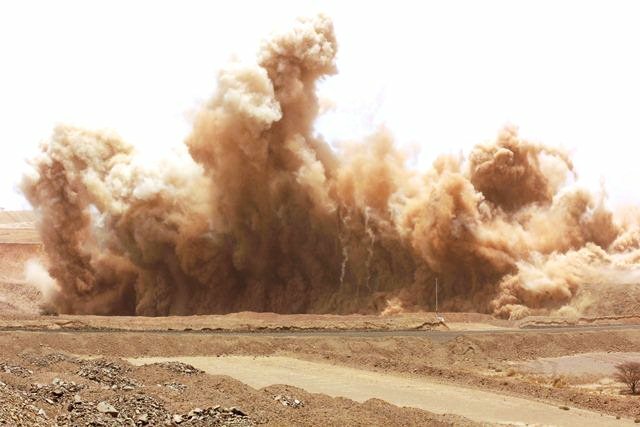 “Rock mass and structure tend to be ignored in blasting, so now we are looking at these two variables when we blast. We are also adding the ore zone joint properties like spacing into the equation,” explained Korhan. The multi-layered approach includes a new equation for blasting that involves rock hardness, the structural intensity of the area, joint spacing and two complex elasticity properties: Poisson’s ratio and Young’s modulus. The result is that Tasiast now has more efficient blasting techniques and uses less explosives. Their research and targeted approach for blasting (in waste predominantly) has allowed Tasiast to focus on the fragmentation of the ore. This has improved over the last six months. Improved fragmentation means smaller rocks after the blast which makes the mining and processing easier and more cost effective. “We’re reducing explosive energy in favourable types of rock and increasing the distribution of explosive energy in harder ore zone,” Michael said. The site has been significantly reducing explosive and drilling costs, expecting to save up over $2-million dollars per year. The Tasiast CI team have been working closely with Korhan and Michael assisting with tracking and monitoring of blast data and cost information. For more technical information on their innovative approach, please directly contact Michael or Korhan.